With only three and a half weeks to go until The Avengers makes its big-screen debut here in the UK, we’re heading towards the final stretch of what’s been a brilliant marketing campaign over the past year. Just yesterday, we got two new TV spots and word of a massive $100m. advertising commitment from Marvel and Disney, and now we have another great new TV spot and an excellent new poster to share. Joss Whedon has directed from his own script, and of course we can look forward to seeing familiar faces from the Marvel Cinematic Universe: Iron Man (Robert Downey, Jr., with Paul Bettany returning as JARVIS), Thor (Chris Hemsworth), Captain America (Chris Evans), the Hulk (Mark Ruffalo, taking over from Edward Norton), Hawkeye (Jeremy Renner), Black Widow (Scarlett Johansson), Nick Fury (Samuel L. Jackson), Agent Coulson (Clark Gregg), Pepper Potts (Gwyneth Paltrow), and Loki (Tom Hiddleston). 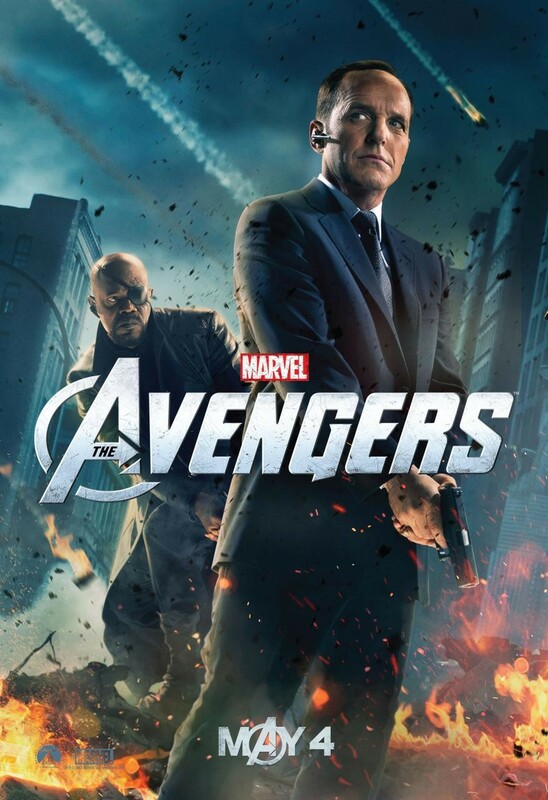 This new character poster of Agent Coulson (Clark Gregg) with Nick Fury (Samuel L. Jackson) in the background complements the two sets of posters we saw last month, and if you missed them, I’d highly recommend checking them out. The Avengers will be released (in the UK, under the name ‘Avengers Assemble’) in 3D and IMAX 3D* on 26th April here in the UK, and then head to the States a little later on 4th May (Star Wars Day). Everything suggests it’s going to be nothing short of an epic blockbuster. For all the rest of our coverage for the film, click here. And as usual with the poster below, you can click to enlarge. *Sadly, it looks like the BFI IMAX won’t be showing The Avengers in the UK, on account of the fact that it’s in digital and not print format. But I hear that it will be playing in other IMAXs across the UK, so seek it out if you live nearby! Source: TV spot via Yahoo Movies and poster via IMP Awards.